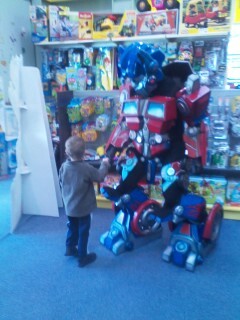 Moar weekend - Optimus Prime! 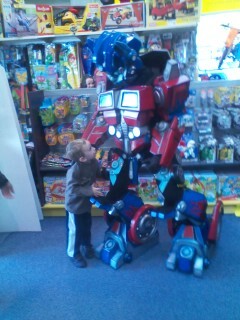 On Saturday Dom got to meet a 7 feet tall Optimus Prime at Toyworld. He thought it was awesome, and got a high five an a handshake (as well as his photo taken). We were pretty impressed by the costume too! Swings and throwing rocks into the river remain popular also. The return of sunny weather has enabled us to have a very fun weekend, including many of Dom's favourite activities. We've taken the scooter out for a trip to the playground (with Dom balancing while Mummy or Daddy holds his hands and pushes), fed the ducks and geese and swans (with signets) at the artificial lake, eaten chicken mcbites at Maccas and had a ride on a miniature train. Debbie's cutting up some fruit for a walk and picnic by the river to round out an active, happy weekend. It's been so, so good! It was fun and easy to film - we just got dom to eat grain waves, play with bubbles and watch Kung Fu Panda on the green screen after school one day. He loved it. We had a few shots in mind that we wanted to get (looking up at penguins, standing on ice) and knew that if we recorded a variety of stuff for about 20 minutes from both eye level and high angle positions we'd be able to experiment. There's a cash prize for the video that gets the most hits on youtube, so I may be tweeting about this film a fair bit in the next month (and facebooking too! ).